Senior Philanthropic Advisor, Kristin Nelson, experimented with her family recently. As part of a community read-along, her family followed the advice and recommendations of New York Times columnist Ron Lieber, in The Opposite of Spoiled in pursuit of raising her daughter, Poppy, as a generous and thoughtful individual. You can find the earlier parts of this series here. In The Opposite of Spoiled, Mr. Lieber suggests that for younger children, making contributions in person may have a powerful and positive impact on the children…and adults. As such, our first stop on the Giving Train was a visit to COTS’ Mary Isaak Center. Vice President for Development Sarah Quinto (pictured above with Poppy and one of the owl banks), generously met Poppy to accept the gift. Together, they picked up dropped nickels and talked about why it is important to give money to COTS. The answer of course, is that “everyone needs a place to live”. Other COTS staff spoke with Poppy, making a lasting impression on her about the act of giving and recognition. She was welcomed, engaged and thanked. Sure, she was shy in the moment, but she didn’t stop talking about the experience, the whole car ride home (and beyond). Several weeks later, our family made a short trip to Monterey Bay Aquarium. We all hoped to see the new wild baby otter, a California sheephead and the family favorite mola mola. As parents we also hoped that Poppy would enjoy her second face-to-face donation which we knew would be different from her first. 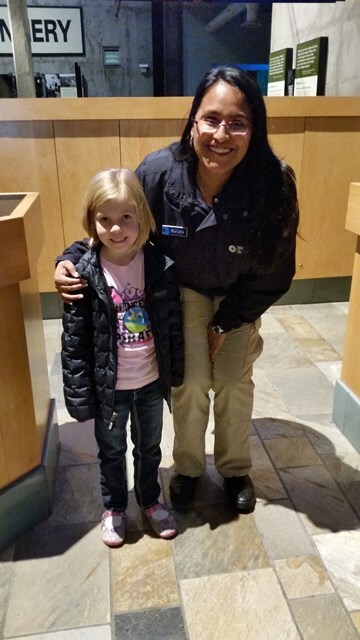 Poppy shyly presented her plastic bag of small bills and change to the membership services desk on a very busy day at the Aquarium. The seasoned staff (pictured here) also welcomed her warmly and made her feel that she did something special through her gift. Last week we received a package in the mail from the Monterey Bay Aquarium. In the package was an adorable stuffed otter and a handwritten note thanking Poppy for her small gift. 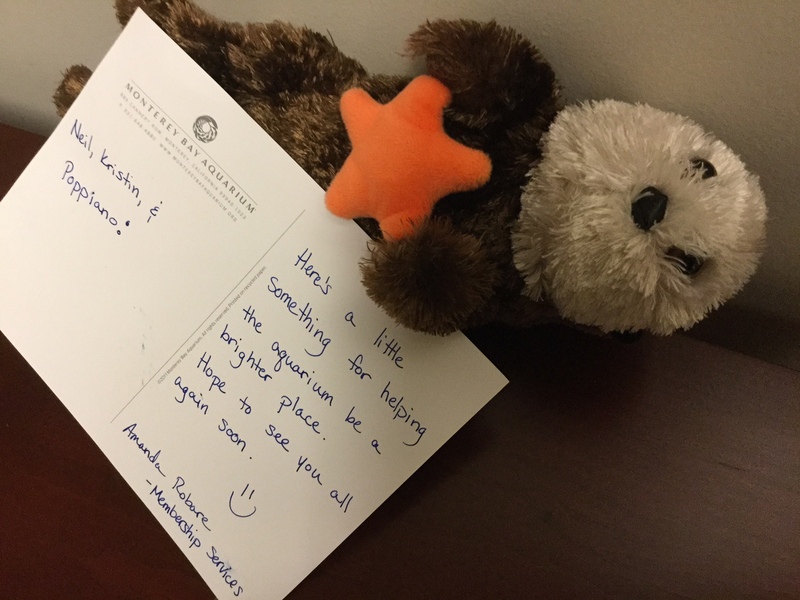 Aside from being smart development work, this note and stuffie (later christened “Puffy”) beautifully and positively reinforced the joys of giving. Talk about incentives to giving! Poppy was hooked. Our next challenge will be helping Poppy understand this incentive system so she can make positive decisions on her own without the manipulation of Puffy the adorable otter (Mr. Leiber refers to this as “giving without benefits”). It will happen within a few years, but right now Puffy is enjoying the prime cuddling real estate every evening and Poppy is asking when the next trip to Monterey will be. According to Mr. Leiber, embracing philanthropy is one just part of raising generous, thoughtful children. My amazing spouse and I are figuring this parenting thing out as we go along, and sometimes we even get it right (perhaps that is a nod to our own wonderful parents and perhaps a bit of dumb luck). That doesn’t happen all the time, though. We realize half way through something that we aren’t consistent, didn’t ask the right question and likely responded in a way that that may cause Poppy to consider therapy as an adult. Based on Mr. Lieber’s advice in The Opposite of Spoiled, we have walked away with a few lessons learned a few reasons to take a deep exhale while saying “phew!” under our breaths. The purpose of the three banks (giving, saving, and spending) was brushed off more than it was reinforced. As parents, our year-end giving would have had a greater impact if we had integrated the purpose of Poppy’s owl banks into our own conversations about giving throughout the year. Knowing my kid as I do, I think that she would have taken those conversations with her throughout the year and looked for opportunities to give that were more meaningful and more thoughtful. We do talk about giving. It is a part of our family tapestry. But we don’t do it enough and we don’t do it strategically. Our conversations tend to be more about “it is the right thing to do” at this stage, not about impact, change agents, community health or loco-giving. Small changes in our conversations and leading by example have the potential to pay off big. Perhaps the biggest place for improvement in my family is the manner in which we discuss money in a general way. Neil (my spouse) was raised in a different culture and is more comfortable discussing a broader range of monetary topics with friends, family, colleagues and possibly even complete strangers, than I am. I tend to carry some old puritan baggage that prevents more open dialogue about earning and borrowing, for example. We might be sending some pretty confusing signals to Poppy. Perhaps philanthropy is the way to bridge those difference (and open the conversation up)? We, inadvertently, do not link chores to the amount of money in the owl banks. This happened purely by accident not by strategic planning. In our house, Poppy does help out – as a six-year old can. She takes her dishes from the table after each meal. She sets the table for dinner and she helps pick up her stuff around the house. She has even started (her idea – not ours) packing her backpack each morning for school. We agreed to provide some allowance to her but due to her age (and inability to reach the cabinet to put dishes away, for example) never made the connection between chores and what she receives. Whew. Mr. Lieber recommends that allowances stand on their own, as a lesson about money instead of an “expectation of compensation”. We excel at celebration and have been pretty good at celebrating well thought out purchases. As Mr. Lieber points out, we all pine for something. As adults, we research the best item for our budget, save, watch for sales, or even impulsively purchase an object or service of our affection. There is joy in that, as well as lessons to be learned. For Poppy, her first purchase was several books from the Petaluma Library’s kid’s book sale. As proud and excited as she was for that “big buy”, I was more so. That day, she began the process of finding balance in her purchases. She realized that she could get five books for her five dollars at the library sale but would need to dip further into her owl bank if she were getting one book at the book store. Research shows that parents are more likely to discuss money and related topics with boys than with girls. Poppy, a six-year old girl, and only child, needs to have the same access to information and transparency that her male counterpart kindergartners have … or more. She should also be “compensated” with her allowance, at the same rate as her male classmates. Let’s eliminate the gender pay gap at home, too. Keep asking good questions and encourage our children (and selves) to ask, ask, ask. Somewhere between childhood and adulthood, some of us loose our natural curiosity. There is an opportunity to slow that decline of curiosity by simply asking children what was the best question they asked today. Mr. Lieber points out that this reminds kids to be assertive in the classroom as well as to approach the world through a different lens. We can show kids that questions and curiosity are valued and welcome around the dinner table and beyond. We aren’t really going to end on a high note. For our family, and many like ours, this is just the beginning of navigating these conversations and interactions with money and philanthropy.